She recently hit out at body shaming trolls. 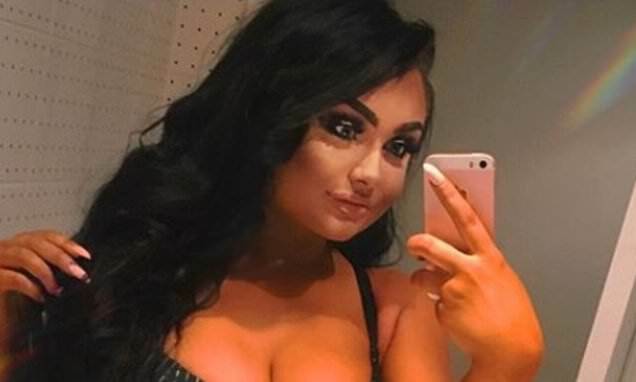 And Faith Mullen continued to flaunt her sensational curves as she shared a sizzling lingerie snap on Monday, quipping that she looked like a 'sponge cake'. The Geordie Shore newbie, 19, looked phenomenal in the steamy shot, as she stripped down to a pair of matching black and white bra and briefs. Posing coquettishly in a mirror selfie, the devout Christian was a vision of beauty as she pouted up a storm and worked her angles. She hilariously captioned the shot: 'All my friends are literally Victoria secret models and I’m just a pure Victoria sponge cake'. Whilst Faith sent fans wild with the steamy shot, she recently had to defend herself after cruel body shamers commented on her curvaceous figure. Taking to Twitter earlier this month, Faith hit back: 'To all the body shamers out there I just want to let you know I am happy with my weight. I am proud to be a size 16 and my weight effects you more than it does me... [sic]'. Faith has been causing a stir as the newest recruit on Geordie Shore, and previously revealed to MailOnline that the show would not have any impact on her religious beliefs.